Foxheart is a classic fantasy-adventure about the danger of lies and the power of truth, the strength found in friendship, and the value of loving and being loved . . . even if it means risking your heart. 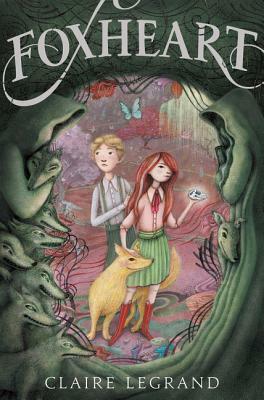 Full of magic, adventure, and an original and compelling cast of characters, Foxheart is a fast-paced fantasy reminiscent of Howl’s Moving Castle. Orphan. Thief. Witch. Twelve-year-old Quicksilver lives as a thief in the sleepy town of Willow-on-the-River. Her only companions are her faithful dog and partner in crime, Fox—and Sly Boots, the shy boy who lets her live in his attic when it’s too cold to sleep on the rooftops. It’s a lonesome life, but Quicksilver is used to being alone. When you are alone, no one can hurt you. No one can abandon you. Then one day Quicksilver discovers that she can perform magic. Real magic. The kind that isn’t supposed to exist anymore. Magic is forbidden, but Quicksilver nevertheless wants to learn more. With real magic, she could become the greatest thief who ever lived. She could maybe even find her parents. What she does find, however, is much more complicated and surprising. . . .
Acclaimed author Claire Legrand’s stunning and original novel will appeal to fans of Neil Gaiman and Diana Wynne Jones.